Hurricane Florence smashed into the US East Coast Friday with howling winds, torrential rains and life-threatening storm surges as emergency crews scrambled to rescue hundreds of people stranded in their homes by flood waters. Forecasters warned of catastrophic flooding and other mayhem from the monster storm, which is only Category 1 but physically sprawling and dangerous. 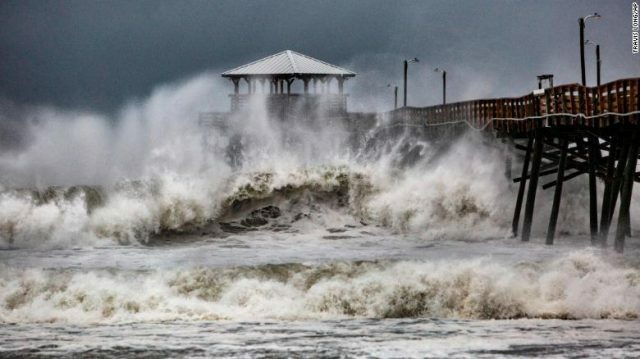 The port city of Wilmington woke Friday to the sound of exploding electrical transformers with strong gusts throwing street signs and other debris as well as water in all directions, according to an AFP reporter at the scene. The storm officially made landfall near Wrightsville Beach, North Carolina at 7:15 am (1115 GMT), the National Hurricane Center said. Ken Graham, the NHC’s director, warned the slow pace of the storm exacerbated its danger even to areas outside its immediate path. “The longer you have this hurricane wind flow, the longer you push that water well inland,” he said. Rescue workers in North Carolina meanwhile were scrambling to save people stranded in their homes. Video footage showed parking lots in the riverfront town of New Bern turn into shallow lakes of dirty gray water as heavy rain fell. New Bern Police Lt. David Daniels said early Friday morning that between 150 and 200 people had been rescued so far, with others still waiting for help. “Currently ~150 awaiting rescue in New Bern,” City Hall said on Twitter. Nearly 300,000 customers in North Carolina were meanwhile reported to be without power as the outer band of the storm approached. In its 1200 GMT advisory, the center said Florence was packing winds of 90 miles per hour (150 kph) and moving northwest at six miles per hour (10 kilometers per hour). It added the greatest threats to life came from storm-surges while “catastrophic flash flooding and prolonged significant river flooding” was expected, with some areas receiving up to 40 inches of rainfall. In a display of the early effects of the storm, one flood gauge on the Neuse River in New Bern, North Carolina, showed 10 feet (three meters) of flooding, the NHC said. With winds picking up along the coastline earlier Thursday, federal and state officials had issued final appeals to residents to get out of the path of the “once in a lifetime” weather system.